The most frequent and also strongest winds in the region of northern Württemberg as a long-term average come from West to Southwest (prevailing wind direction). 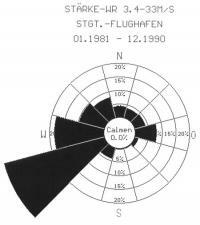 This can be seen in the wind rose (not restricted to this location) at the airport in Stuttgart-Echterdingen, which is represented in figure 3.2 (established on the basis of the data from Flugwetterwarte Stuttgart (a meteorological service indicating flying weather) from the German Meteorological Service). 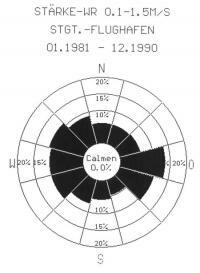 The 12-parts wind rose at Stuttgart airport is dominated by a wind direction sector between Southwest and West (230 to 250 degrees) as the prevailing wind direction with a frequency of 18 %, besides 15 % lulls. The average wind speed in our climatic region is only 2.5 m/s. 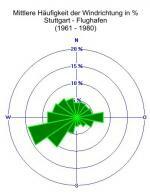 This means that Greater Stuttgart is a region with relatively low wind speeds. Hamburg, for example, has an average wind speed of about 5 m/s. Flat inland regions usually have average wind speeds of about 4 m/s. The above-mentioned very low wind speeds of up to 1.5 m/s (including lulls) have an average annual frequency of about 44 %. The frequency of low wind speeds increases slightly during the winter half year and reaches 46 %.